Do banknote designers have a sense of fun, or a sense of the esoteric? If they do, it is unlikely that they often express these traits in their work. Banknote designs range from the austere to the aesthetic, but rarely can a sense of the esoteric be found in a banknote, or even a sense of fun. There is, however, proof that at least one banknote designer has these qualities. His work can be found on the last French 50-franc banknote. 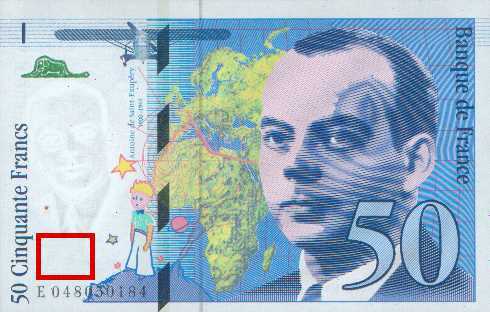 First issued in 1992, the 50-franc note honours the life of Antoine de Saint-Exupéry (1900–1944), a French aviator and author. After obtaining his pilot’s licence, in 1926 Saint-Exupéry joined a French company that established mail routes over northwest Africa, the South Atlantic and South America. He later worked as a test pilot and, during the Spanish Civil War, as a reporter. Although he suffered numerous injuries due to flying accidents, on the outbreak of war in 1939 he became a military reconnaissance pilot. At the fall of France in 1940 he went to America, but later returned to North Africa as a reconnaissance pilot. He was shot down and killed on a mission over the Mediterranean in July 1944. As well as an aviator, Saint-Exupéry was a highly regarded author. He chose as his subjects airmen who undertook heroic adventures, some of which may have been based on his own experiences. His novels include Courrier-Sud (‘Southern Mail’ published in1929) and Vol de nuit (‘Night Flight’ 1931). He recounted his own experiences in Terre des hommes (1939), which was translated into English as ‘Wind, Sand and Stars’. Further personal experiences are retold in Pilote de Guerre (1942). While these works retain a certain popularity and enduring regard, it is for his fable of Le Petit Prince (The Little Prince), published in 1943, that he is best remembered. The 50-franc note carries a portrait of Saint-Exupéry on the front, along with a map of Europe and Africa, while the back shows a bi-plane over the desert with wild weather in the sky. On the front and back of the notes is Saint-Exupéry’s depiction of the Little Prince standing on his home planet, Asteroid B-612. This illustration is a perfect registration device for the banknote. Above the watermark, which is an image of Saint-Exupéry, can be found a drawing of an elephant inside a boa constrictor. This simple drawing is taken from Le Petit Prince. When the aviator was young, he had drawn a boa constrictor with an elephant inside, but only the shape of the elephant was apparent. ‘I showed my masterpiece to the grown-ups and asked if my drawing frightened them. The second drawing, of the inside of the boa constrictor digesting an elephant, is printed on the banknotes in colour-shifting ink. When viewed at one angle, the ink is green, but when viewed at another angle, the ink is blue. The aviator’s encounter with the Little Prince commences after he is forced to land his plane in the desert. After sleeping, he wakes to find the Little Prince standing next to him. The Little Prince immediately demands the aviator draw him a sheep. The aviator drew a sheep. ‘He [the Little Prince] looked at it carefully and said: “No. That one is already very sick. Draw me another one. ‘Once again, I made another drawing. ‘But it was rejected too, like the previous ones. ‘This one is too old. I want a sheep that will live for a long time. ‘My patience had run out by then as I was in a hurry to start dismantling my engine as soon as possible, so I scribbled this drawing. And I explained: “That is only the box. The sheep you asked for is inside. Printed in white ink, just below the watermark, is a copy of the ram that was rejected by the Little Prince. As it is printed in white ink, the image is, to all intents and purposes, hidden. However, if the note is tilted at a certain angle, light can be seen reflecting from the white ink and if the note is subjected to ultra-violet light the ram will fluoresce. The inclusion of the drawing of the elephant being digested by the boa constrictor and the ‘hidden’ picture of a sheep create one of the nicest twists to the design of a banknote. The elephant inside the boa exemplifies those people who ‘always need explanations’. The sheep, on the other hand, is not initially apparent and reflects the conviction expressed in Le Petit Prince that ‘What’s essential remains invisible to the eye.’ The two drawings on the banknote are an esoteric interpretation of sentiments expressed in Saint-Exupéry’s work and prove that at least one banknote designer has a sense of the esoteric and, by hiding the sheep, a sense of fun. One can be certain that Le Petit Prince was bed-time reading for the designer, both as a child and as an adult. Note: The red box on the banknote indicates the location of the hidden sheep.